Vizualize.me, a local startup, is riding a wave of public interest after winning first prize at the Toronto Startup Weekend last month. 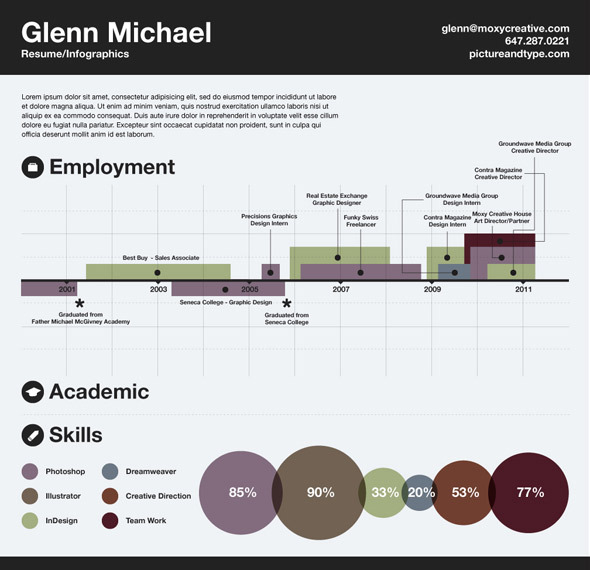 The web-based app takes user data from LinkedIn and turns it into a customizable infographic. At long last, employers can read about your typing speed in a tastefully-rendered flowchart complete with Helvetica typeface. Eugene Woo, CEO of Vizualize.me, brought his idea from concept to reality in only a few short months with the help of his seven-member team. "We do live in the age of data overload," he says. "We're constantly assaulted by text and images." After seeing Chris Spurlock's visual CV go viral in February (and landing him a job at The Huffington Post in the process), Woo saw an opening. until the end of May. On June 3rd , the opening night of Toronto Startup Weekend, he pitched his idea to attendees by printing it on a t-shirt. "I think I called it 'Resume Graphics' or something like that," he recalls. "I put it on a t-shirt to show the idea that this was about visual information." The following day, Woo formed a team and created a website. By Sunday, Vizualize.me had gathered 3,000 signups, 20,000 views, and won first prize of the weekend. Woo credits his team's early success to the support of his fellow entrepreneurs in the Toronto startup community. "From my point of view, the Toronto scene definitely has helped," he says. "It's a great group of people, very active...doing lots and lots of stuff." As of this post, the site has around 30,000 unique users signed up for the service; a number that is made even more impressive by the fact that Vizualize.me has no active marketing to speak of. All of their traffic comes from local interest, blogs and word-of-mouth. The site will enter a private beta phase within the next two weeks, and Woo plans to have a full public beta running by the end of the summer. Signing up to the site now gets your name on the list, and sharing the link with your friends (also known as "The FarmVille supremacy") moves you up the list. As the popularity of Vizualize.me grew, its target demographic changed. "We started targeting creative professionals, but right now the target is anyone," says Woo. "Any professional that has an online presence with LinkedIn." Once a user has synced up Vizualize.me with their LinkedIn data, they can customize the template, layout, colour scheme and typeface of their infographic. Woo hopes to add drop-in functionality, so users can upload their resume as a document file and have it automatically converted. Woo even says that a long-term goal of his team is to allow users to even run their Facebook data through Vizualize.me, but he realizes that they have a long way to go before they can climb Mount Zuckerberg. Vizualize.me provides a welcome opportunity to bring colour and personality to the Microsoft Word-dominated world of resumes. Spurlock's story proves that employers are willing to give creative applications the time of day, so why not give your battered CV the summer makeover it deserves? Writing by Mike Scholars. 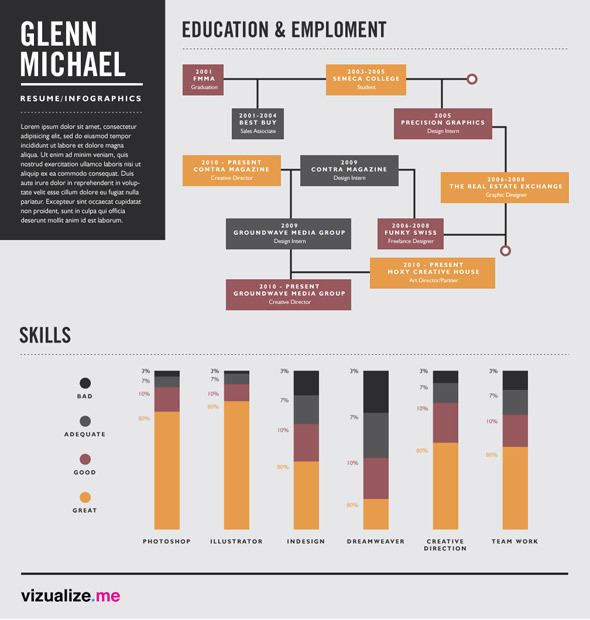 More samples of Visualize.me resume infographics below.